Look up! An interesting phenomenon is taking place up in the air! Drones have taken over current aerial photography. Why drones? What makes them excellent photographers? And why are some business opportunities booming because of them? Drones started a new era in aerial photography. Drones became indispensable assistants in taking photos of small-terrain compartments where high-resolution image detail is needed or where photography done by humans deemed problematic. Now drones have become serious competitors of helicopters and planes beating them in price, quality and mobility. – Drones can levitate vertically upward and “hang” at the same height as long as necessary to take a photo. – Electric motors of up-to-date drones produce no vibrations; this ensures high image precision even with an extended optical exposure. – Drone cameras are very flexible; they can rotate and shoot in any direction by commands given remotely. – Drones can take photos at any time of the day and in any season. – Access to images from drones is immediate. You just review the shots right away and initiate a new flight by a drone if you are not satisfied with photo session results. – Buying a drone is less expensive than ordering a flight by helicopter or plane. Moreover, your drone will not desert you. 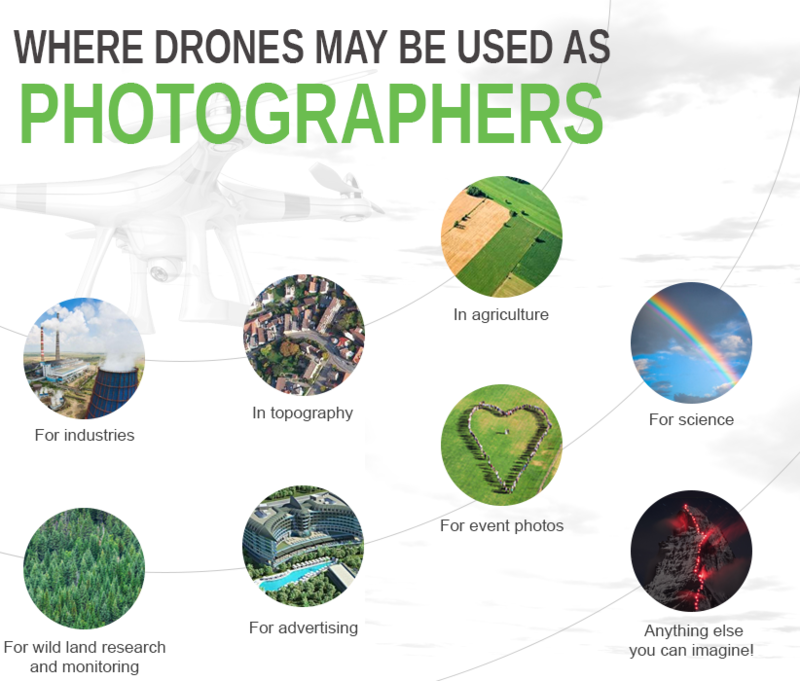 – Photos taken by drones are a great alternative to satellite images. Google Maps updates its images every few years with a maximum resolution lower than those delivered by professional cameras. With the help of drones, it is possible to create a map with detail 20 times greater than produced by Google Earth. All the above-mentioned advantages of drones became evident very soon after drones entered the market, and those advantages just keep getting better. Little wonder there is a boom of startups in many countries of the world focused on working solely with drones searching for unique niches. In particular, many companies offer aerial photography with drones. So why use a drone photographer? – Number of blades (they assure both lifting bar and steadiness at the same time). Usually producers provide a standard even number of blades (2, 4, 6, 8 or 12), but you may also find drones with 3 or 5 blades. The higher number of wind sticks, the higher power and stability. – Size. A too-small drone might not be able to carry additional equipment (for example, photo or video camera). A too-large drone might seem too expensive. Small size means light weight for a drone, and this means quick response and great agility. Conversely, these, small, light-weight, agile drones perform poorly even against a light breeze and are buffeted about so photo shoots are not possible. Large drones fight wind well, but require powerful batteries. Only large drones are capable of carrying serious professional video equipment, but they are heavy. Producers strive for weight reduction, increasingly using innovative superlight materials for such models. – Methods of operation. Drones differ with the types of devices controlling them (e.g., a remote control or a smartphone) and with the number of controlling channels. Drones with three controlling channels are the easiest ones to operate; four channels are for experienced people; we leave six or more channels to the experts. – Accumulator capacity and flight length. The accumulator capacity indicates how long the drone is able to fly without recharging. – Photo resolution. It should meet photo stock requirements (not lower than 5 MP, on average). Raw photo format should be supported. – Video resolution and framing rate. It would be nice if your drone camera has a minimum 1920×1080 resolution. – Controlling range. Might vary from 500 to 1500 meters. This indicates how far you can operate your drone. 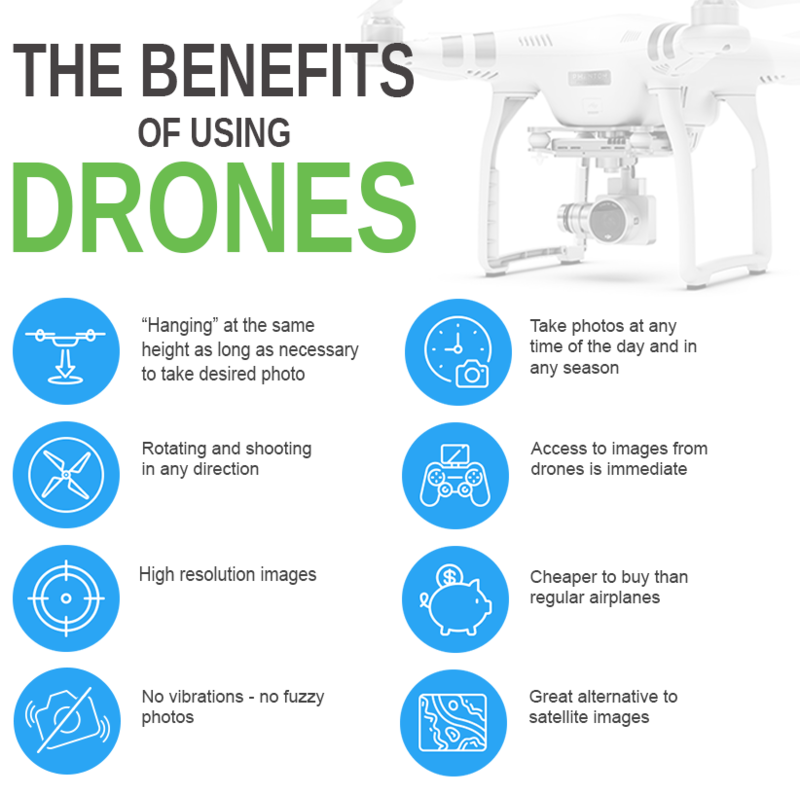 Experts all over the world encourage using drones for specific tasks, because photos shot by drones have a higher resolution, lower price point and a quicker, easily method of delivery compared to other methods of aerial photography. Our company is happy to help you with the development of specific software for your start-up. Do you have a unique idea of how drones can be used? Does it require specific software to accomplish your dream?